#6-16 Antique Brunswick ball rack for wall-mounting. Manufactured in the early 1900s, solid birch construction with dark cherry colored finish. Gold-leaf numbers designate each of the six shelves. 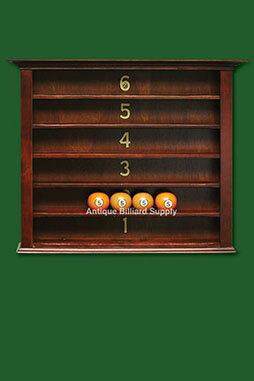 Simplicity of design helps to accent antique pool balls or other billiard memorabilia on display.